the In 2011, I hosted a WordMagic Garden Party at Olandar, the magical home of Leigh and Carla McCloskey in Zuma Beach, California. Because I have much of my WordMagic poetry stored in my memory I often enjoy improvising the selection and sequence of verse that I share. At some point in the program I mused out loud, ‘What shall I share next?’ Just then, a flock of birds flew out of a tree and I absolutely knew that they wanted me to share my poetic vision about what will happen once we creatively, collectively upgrade the English language to a higher frequency so that it is as nourishing to the planet as bird song and cricket choirs. When I wrote that three-page vision-in-verse, I wondered if I wasn’t perhaps ‘gilding the lily’ in the extraordinary images I was creating of the ‘open sesame’ sort of magic that could be created by such an organic language. Years later, however, my neighbors, Anne and Whitley Strieber, gave me a book by the mythologist William Henry called The Language of the Birds. ​In it, I found that even my most far-out fantasies were completely congruent with ancient mythology. In Late June of 2016 …. I shared my WordMagic anthem, Taking Command of the English Language at a garden party in Portland, Oregon in June of 2016. At some point in the performance, I noticed that everyone was gazing upward. So I did, as well, and saw a hummingbird hovering above me, spinning and darting away, and then returning to hover again. I wish someone had photographed it. In any case, here is a picture of a little hummer from another special occasion: One night in 2015, I came home after a three week absence, And as I approached the stairs leading to my apartment, I was amazed to see three hummingbirds circling like moths the donut shaped light at the top of the landing . I watched them in awe for a little while. Then, at my request, a neighbor turned off the light and two of the birds flew off. 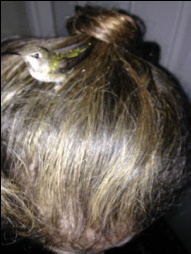 The third one landed on my head, so I carefully walked down the stairs so that he had room to fly away. He hesitated for close to a minute—then off he went. What a greeting and what an honor that was for me. Given that the genesis myths of most cultures of the East and West point to the Word as the original Source, force and substance of Creation, isn’t it time we put our articles of faith in the power of the Word to the ultimate test—by upgrading English so as to create a new Language of the Heart (an anagram for Earth) that uplifts all Creation? If you resonate with this idea, please look at the Vision statement and the pages beneath it. Then contact me if you’d like to play. Pg. 3: … Because it uses phonetic resonance the Language of the Birds is called a ‘phonetic cabala’, a phonetic language code. … This code equates words that sound alike in different languages, connecting word concepts by sound in English. These language connections reveal astonishing literary and historical synchronicities or meaningful coincidences that point to the interconnectedness of all creation. Pg. 4: …Nature is connected. It is the logical mind of humankind that separates. By learning this language we become more fully reconnected and resonant with the matrix of English life. We learn to work with nature’s forces and to explore the relationships between all the wonders of her creation. With this language, promise mystics, we can heal our world and ourselves, transforming it from wasteland into a garden or a paradise. When ‘in tune’ or resonating with nature we bring magic into our lives and an effortless flow of synchronicity. Pg. 5: In addition to Peace and magic, acquiring the Language of the Birds, and its power of words, also brings access to secrets. Understanding the world through this sacred language brings enlightenment. … Often these secrets are represented by some object (usually a stone) guarded by a serpent or dragon, sometimes near a tree. … This object and tree often symbolize the gateway to Heaven, the point where communication is established between Heaven and Earth and immortality is achieved. Pg. 14: Mythologically speaking, the Bird Language contains the ‘open sesame’ to the paradisiacal state of the gods. This is why it is considered to be the language of synthesis and integration with nature. For this reason birds are often taken as symbols of the angels, who guard the ladder to Heaven, like the story of Jacob’s Ladder. Pg. 15: …. The ultimate wisdom the Language of the Birds confers concerns the means to enter an ecstatic state and open the gateway to God. Pg. 18: …recovery of this language (as Jesus knew) would allow, among other things, re-entry to the Garden. Pg. 121: …The first key to the Language of the Birds is that this code equates words that sound alike in different languages, connecting word concepts by sound in English. How did English come to be the language of the Birds? The answer is, the language in which these words have meaning to the mythologist is not exactly English either. In the Language of the Birds (or Bards) English becomes L’Ang(l)ish or L’Angel-ish, the Language of the Angels. Pg. 127: …Connecting words in this way creates a ‘tunneling effect’ through time and enables us to ‘cross over’ the timeless metaphors of humanity. Pg 130: … [referring to a Hebrew word] by interchanging the vowels, the punning, hyperdimensional Language of the Birds may also be thought of as the Language of Life. … Obviously the ancients had a far different view of language and the power of the word than we sophisticated moderns. Pg. 133: …Another example of the hyper-dimensional aspect of the Language of the Birds, and the fourth key to deciphering Mystic Grail stories with it, is the way it makes extensive use of mirror reflection and symmetry to conceal wisdom concerning the secrets of life. Pg. 135: …All we need do is learn to ‘click on’ one part of a word and the whole can become illuminated. In this way the Language of the Birds is holographic. Pg. 136: …Believe me, this is not the kind of knowledge one gets at a university. It’s more like what a billionaire buys for $30 million in a codex (Latin for book or bound manuscript) or a rare painting at a secret auction at Christie’s. Or a spiritual seeker acquires by floating round and visiting the places on Earth where such knowledge is stored and downloading it out of the landscape directly to the brain (if one knows how to do that). It is likely that this is the kind of knowledge which Solomon and the Knights Templar busied themselves with.